This tutorial describes how a Griffon 2 application can be created and run. IDE configurations are discussed too. Lazybones: template based project generator. Maven or Gradle: build tool. IntelliJ IDEA or NetBeans or Eclipse: IDE. SDKMAN is a tool for managing parallel Versions of multiple Software Development Kits on most Unix based systems. It provides a convenient command line interface for installing, switching, removing and listing Candidates. The candidates we’re interested in are Lazybones and Gradle. You can run SDKMAN on Windows as long as you have a POSIX environment. We recommend you to give Babun Shell a try first. Lazybones is a command-line based tool for creating basic software projects from templates. It’s similar in spirit to Maven Archetypes, however Lazybones templates can do much more than that, for example, new files can be created from scratch, even long after the project was created. As mentioned before, Lazybones relies on templates in order to create a project. There are a handful of templates available at the default Lazybones location. The Griffon based templates reside at a different location, so they must be configured in order to be found. Lazybones uses a simple configuration scheme for defining repositories, as up to version 0.8 this configuration is kept in a Groovy script whose standard location is $USER_HOME/.lazybones/config.groovy. Windows users should use the %USER_HOME%\.lazybones\config.groovy path. Gradle is an open source build automation system. Gradle can automate the building, testing, publishing, deployment and more of software packages or other types of projects such as generated static websites, generated documentation or indeed anything else. Gradle 4 is the minimum supported version. Maven 3 is the minimum supported version. All major IDEs can be used to build Griffon applications. Considering that the Griffon tool chain is comprised of tools that can be invoked from the command line you may want to use a text editor (such as VIM) instead. The master pom uses a profile to make sure that classes and resources are properly handled before the application’s main class is run inside a JVM process. Configuring IDEs is not that difficult considering that Griffon 2 projects can be imported either as Gradle or Maven projects, in other words, there’s no need for a special IDE plugin to build and run a Griffon 2 application. Both IntelliJ IDEA and NetBeans have a Griffon plugin (IDEA has it installed by default). These plugins were designed to work with Griffon 1 and are incompatible with Griffon 2. Do not use these plugins to work with Griffon 2 projects! You can import a project either using the Gradle or Maven import. Once you do you’ll be able to invoke build goals using the respective build tool view. 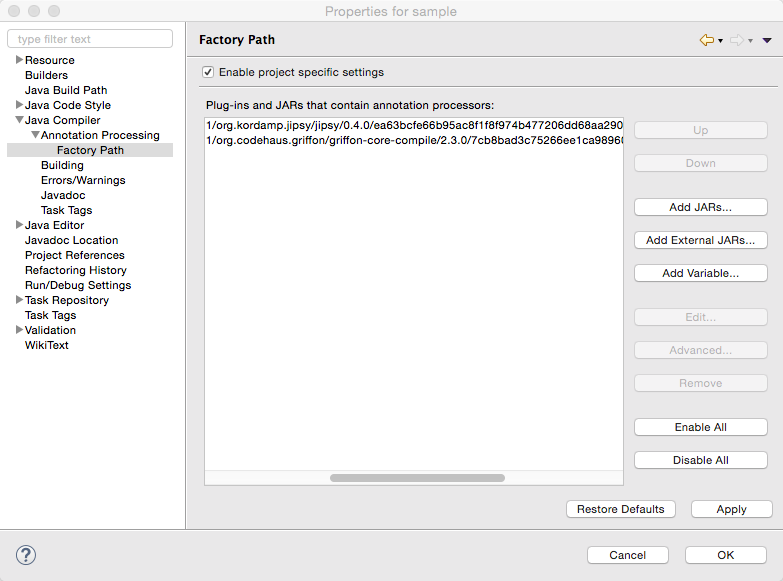 Mac OSX users must run IntelliJ IDEA using JDK7 (the default is JDK6 in Intellij 15) otherwise the Gradle plugin will not be able to import the project and will fail with a cryptic error. Finally, check that all *-compile JARs are added in the PROVIDED scope, also jipsy-0.4.1.jar (for Java and Groovy projects) and gipsy-0.4.1.jar (for Groovy projects). NetBeans can import Maven projects without additional plugins. You must install the Gradle plugin first if you want to build Gradle based projects. The Gradle plugin is directly accessible from the default plugin location as configured in the Plugins preference panel. 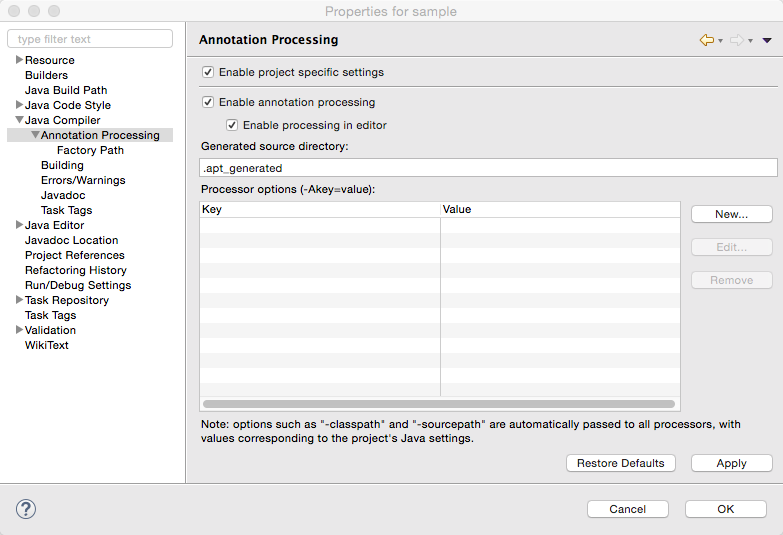 NetBeans is able to pick up Annotation Processors automatically from the classpath, there’s no extra step needed. Unfortunately Eclipse is the odd member of the three IDEs. You must locate and install the m2e (Maven) and gradle plugins that are compatible with your current Eclipse installation. Once you do, you will be able to import the project directly into your workspace. Finally, Annotation Processing must be manually enabled. You must do this in a per project basis. 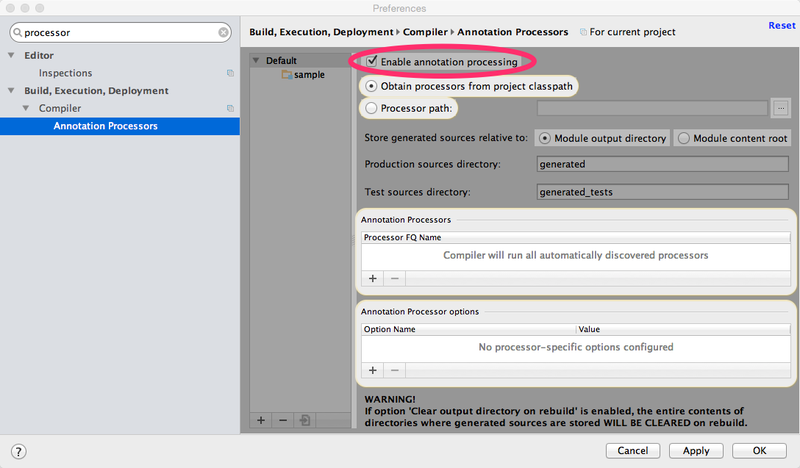 Search for Annotation Processing in the project’s properties and tick the checkbox to activate this option. You must also define every single JAR file that provides APT processors. The most basic ones ar jipsy and griffon-core-compile. These JARs are found in your build tools' cache and/or local repository. As a rule, all griffon-*-compile JARs provide APT processors and AST transformations.